for Art No. 31101-31106, 31201. Arms freely adjustable without distortion. With a powerful magnetic force it can be held on vertical faces, upside down or on round bar. Hydraulic type tightens three joints simultaneously just by one touch operation. 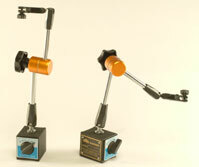 Arms are freely adjustable without distortion. 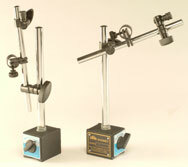 Equipped with fine adjuster and medium size magnet for stabilizing the base.